Cologne – The Rhein Chemie Additives (ADD) business unit of Cologne-based specialty chemicals company LANXESS is presenting itself in top form at the Tire Technology Expo 2016. The restructuring that took place over a year ago, combining the majority of the company’s additive business under a single roof, also benefits LANXESS customers in the tire sector. These benefits go beyond the ongoing investment in the expansion of the innovative Rhenoshape bladder business. Further focal points that the ADD rubber experts will present at LANXESS’ Stand C112 will be predispersed, polymer-bound additives, processing promoters and both vulcanization and filler activators. The wide-ranging portfolio of Rhenodiv release agents, the Rhenomark family of tread marking inks and the highly innovative Rhenowave inline process monitoring system, which is of particular benefit to high-volume rubber processors, will also be in the spotlight. In addition to this, LANXESS applications development expert Torsten Ziser will give a detailed presentation on the opportunities and challenges of using processing promoters for silica compounds and their impact on the vulcanizates’ final properties. “The tire industry remains one of our most important customers,” says Dietmar Hoff, ADD’s Head of Product Management Tire Products. “Bladders and the associated release agents alone account for around a fifth of our rubber business line’s sales. LANXESS is the world’s only independent supplier that can offer these bladders together with perfectly matched release agents from a single source. 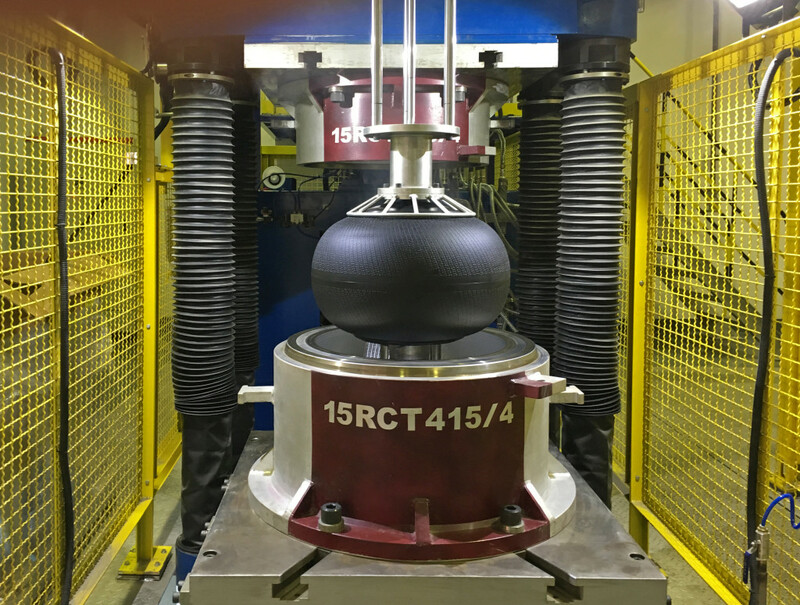 Bladders with a permanent coating make life even easier for tire producers – they help make the production process far more efficient by removing the need for constant respraying of release agents,” he adds. LANXESS’ commitment to its bladder business includes a new bladder production line for making tractor tires in Burzaco, Argentina, and the recent opening of a new line producing vulcanization bladders for car and commercial vehicle tires in Qingdao, China. This line – LANXESS’ fourth bladder production operation – is intended to strengthen the company’s global production network in this key region in particular. After all, China produces more tires than any other country in the world. The Qingdao plant produces bladders using both compression and injection molding processes. LANXESS’ other bladder production sites are constantly being expanded. At the moment, for example, new extruders are being added. In addition to this, LANXESS’ very own Rhenowave system is being implemented at the Porto Feliz site in Brazil. This inline process monitoring system from LANXESS operates as an integral part of the mixing and extrusion line and is being taken to the next level in Brazil, with Rhenowave using ultrasound to detect impurities in the rubber compound without the need for time-consuming spot checks. The system can now also directly evaluate the extrudate’s homogeneity. The latest advances even make it possible to analyze the distribution of vulcanization agents such as Rhenogran AP – by adding appropriate markers. “Thanks to Rhenowave, we can now finally make valid statements about the dispersion of fillers and crosslinking agents – directly on the extruder where it matters,” says Benjamin Bechem, Marketing New Technologies. “The system thus enables users to make their production more cost-efficient without any increase in scrap rates. Numerous users of continuous production processes in rubber applications development have previously faced a major conflict of objectives,” he adds. The new structure of the ADD business unit also promotes synergies within LANXESS. The opportunities opened up by using synthetic plasticizers in rubber are just one example. It may even be possible to influence the dynamic properties of tires – this is currently being analyzed. Rubber chemistry expertise remains a key mainstay of Rhein Chemie Additives. This is also demonstrated by the presentation entitled “Processing promoters as problem solvers for silica compounds” that LANXESS applications development expert Torsten Ziser will be giving to an audience of trade specialists in Hanover. The purpose of processing promoters is to distribute fillers as homogeneously as possible in the rubber compound. They do so by reducing the compound’s viscosity – but this can also affect the vulcanizate’s properties. These additives can also help shape the tire’s performance. For example, using Aktiplast STA/S or Aktiplast GE 2340 leads to a reduction of tan δ at 60 °C and results in lower rolling resistance. In his presentation, Ziser will be looking at LANXESS’ comprehensive portfolio for this problematic application while also providing details of the properties and special features of particular products. “We invite all visitors to the conference to discuss this issue and other concerns with our team manning Stand C112. LANXESS deliberately focuses on selected additive markets – wherever our products, technologies and services can really achieve something and create added value. The tire industry is without doubt the ideal market – and the Tire Technology Conference is its flagship event. We’re looking forward to talking with fellow specialists,” says Hoff. Further information is available at www.rhenowave.lanxess.com. LANXESS is a leading specialty chemicals company with sales of EUR 8.0 billion in 2014 and about 16,300 employees in 29 countries. The company is currently represented at 52 production sites worldwide. The core business of LANXESS is the development, manufacturing and marketing of plastics, rubber, intermediates and specialty chemicals. LANXESS is a member of the leading sustainability indices Dow Jones Sustainability Index (DJSI World) and FTSE4Good.